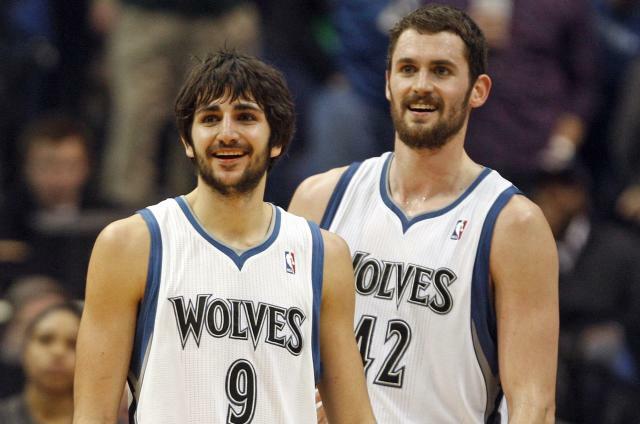 Editor's Note: After Kevin Love broke his hand, Alex Theoharides was able to pull through a week of depression and heavy, heavy drinking and make good on his preview of the 2012-2013 Minnesota Timberwolves. For those of you concerned, Alex is up and running again and feeling generally optimistic about the Timberwolves season. Plus, he has no lingering liver damage! Rule One: You can’t sweat the small stuff. Like many a mix-CD, the 2012-2013 Twolves are scratched and dented. Ricky Rubio won’t rejoin the team until mid to late December (the only Christmas present I want guys). Kevin Love is out until late November with a hand injury he sustained doing knuckle pushups (yes, that’s what he’s going with). The Twolves’ current backup point guard JJ Barea is easily confused for Tyrion Lannister. Brandon Roy may or may not have knees. According to Zach Harper, Nikola Pekovic spent the off-season fighting dragons. And Derrick Williams’ game is just so … ugh. But this year’s roster is well suited to deal with tough times. Led by Rubio, who tore his ACL and MCL when Kobe Bryant put an evil hex on him, the Twolves have been surprisingly upbeat about their chances to make the playoffs this season. Rubio has bombarded his tweeps with a series of inspirational (and yes, adorable) messages and pictures about his recovery. Love was so frustrated by his own injury that he flew home to California to get away from the game; however, he also has supported his teammate and seems determined to get back as soon as possible. Brandon Roy appears to be convinced that having working knees really doesn’t matter for a basketball player. Andrei Kirilenko speaks with the calm assurance of a man nicknamed after the world’s deadliest gun. Pekovic doesn’t worry about anything except being locked out of the weight room. But even that isn’t a real worry. We all know, it’s impossible to keep Nikola Pekovic out of anything—let alone a weight room. Finally, Coach Rick Adelman is the ideal coach for a scratched and dented lineup. Remember how deftly he managed the Rockets through Yao Ming and Tracy McGrady’s injuries? Slick Rick knows how to deal with injured players. He never shows any emotion. He never gets too high or too low. Unless, you ask him about Derrick Williams, then he always slips into a deep depression. But … never mind all that. If the Twolves can survive the first half of the season with a solid record, before hitting their stride after the All Star break, they’ll be just fine. Just keep telling yourself that Alex. Don’t worry ‘bout a thing. Hakuna Matata. It means no worries for the rest of our days. It’s our problem-free philosophy. The Twolves will be just fine. We can have nice things. Really, I promise you Alex. The Twolves will be just fine. Rule Two: You need to get rid of any idiots on your roster. Hit the road Martell Webster and your ridiculous hair. Adieu Anthony Randolph and your gumby-esque physique. Goodbye Michael Beasley and your in-game conversations with yourself. Farewell Darko Milicic and your manna from heaven. Tata Wes Johnson. Even though you weren’t an idiot, you couldn’t make shots. Which equates to idiocy for a basketball player. Rule Three: When ordering a White Russian always ask for two. Andrei Kirilenko is infamous in the NBA community for a few reasons. 1) He has crazy Russian eyes. 2) His nickname is AK-47, which is appropriate because he actually grew up in the town where they make AK-47s. 3) He has a giant tattoo on his back of his character from World of Warcraft. 4) Back when he played for the Utah Jazz, his wife gave him a very public hall pass to sleep with one other woman of his choosing. 5) Those crazy Russian eyes. However, Kirilenko is also a very capable basketball player, who should fit perfectly into Coach Rick Adelman’s corner offense, which places an emphasis on ball movement, lane cuts, and corner threes. He is also -- by far -- the best defensive player on the Twolves’ roster. Alexey Shved, meanwhile, is largely an unknown, which makes him fascinating. Let’s review the facts: He wore a panda bear shirt on his first visit to Minnesota. He has the same haircut as every single female soccer player ever. He wears braces and is painfully shy. His nickname, at least locally, is “Shveddy Balls.” And he has the tall, lanky frame of a young Boris Yeltsin. What’s not to like? Rule Four: If you lose your knees, just make a pact with the Devil. I’m 90% convinced Brandon Roy will play five games for the Twolves before collapsing on the court and making all of us extremely sad. I’m 9% convinced that the miracles of science in the form of platelet-rich plasma therapy will make it possible for Roy to play most of the season, albeit as a poor replica of the player he used to be. And I’m 1% convinced that Roy sold his soul to the Devil known as Kobe Bryant (really, is it just coincidence that Bryant had the same surgery?) in exchange for new knees and that Roy will be just as good as he ever was. Rule Five: You need to keep your star happy. While training for the Olympics, Love expressed his disappointment that he was the lone player (other than rookie Anthony Davis) on the Olympic roster who hadn’t made it to the postseason. "It's tough seeing all these guys that are young and older who have all played in the playoffs. When they start talking about that, I have nothing to talk about," Love said. "If I don't make the playoffs next year I don't know what will happen." Of course, this quote resulted in internet hysteria, as local bloggers hyperventilated about Love leaving the team and fans across the country began to salivate at the opportunity to trade for the best power forward in the NBA. Look, I waver in my opinion about Kevin Love. On the one hand, he’s worked hard to become one of the best players in the league. He rebounds everything, is an excellent three point shooter and passer, and he is developing a back to the basket game. He also has been great in the community. He constantly meets with fans, attends charity events, and interacts with his tweeps over social media. On the other hand, there is a part of his game that seems secondary to his hype, to his creation of the K.Love (gross nickname broheim) brand. I don’t trust him with my loyalty, and I don’t trust that his game is suited to him being the star of a franchise. Ideally, I think Kevin Love is a 2nd or 3rd player on a championship team. The Olympics were an excellent example of this. He fit in perfectly with the star-studded lineup, content to play his part and do whatever was asked of him. However, Kevin Love is the star of the Twolves. Ricky Rubio is still largely an unknown. Can he learn to shoot? Will he fully recover from his surgery? Will he ever be more than the world’s greatest version of Jason ‘White Chocolate’ Williams. I hope so. But I can’t say so for sure. Nikola Peković is developing into a dominant center; however, he plays at a time when centers are slowly being phased out from the league (note: on the All Star ballot they’re now called “frontcourt” players). Derrick Williams still doesn’t know what his role is in the league. Is he a 3 or a 4? Is he a shooter or a post-up player? Can he cover anyone? Me, you, everyone we know? No, no he can’t. Brandon Roy’s knees might go out at any instant. Andrei Kirilenko plays like Scottie Pippen, never like Jordan. Yes, it’s clear that Kevin Love is the star of the Twolves. If I’ve been a doubter of K.Love, than David Kahn has been the President of the Kevin Love Haters’ Club. David Kahn didn’t draft Kevin Love; he doesn’t love Kevin Love; he might not even like Kevin Love. However, this offseason, he finally realized that in order to keep his job as President of Basketball Operations for the Timberwolves he needs to keep Kevin Love happy. Last season, the Timberwolves took a step forward. They won more games in a shortened season than they had in a regular length season since 2006-2007, and were in contention for the playoffs until first Rubio, then Love, and then Pekovic went down with injuries. This offseason, Kahn continued a trend of moves designed to keep Kevin Love happy. First, he placed a larger amount of control in the hands of head coach Rick Adelman, whose relationship with Kevin Love dates back to his days in Portland, when his son played on the same AAU team as Love. Next, Kahn traded a draft pick for the rights to Chase Budinger, who just so happened to also play on the SoCal All Stars with Love. Finally, Kahn cleaned house, shipping off most of the Twolves’ young, project players and replacing them with cagey veterans like Roy and Kirilenko. At least for now, Kevin Love appears to be happy with the moves Kahn made in the off-season. And keeping Love happy, might have been Kahn’s greatest move of all.